Adventure Game Studio | Games | Don't Worry, I'll Bring The Beer! Download Don't Worry, I'll Bring The Beer! A short point-and-click adventure made for itch.io LOWREZJAM 2017. 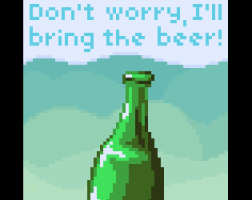 A short and lovely game in really low resolution (64 x 64 pixels!) about a guy getting beer for a party. What better aims in life could there be? The pumping soundtrack and the detailed, yet small pixel graphics motivate to play through the game in one go. It is only ~5 minutes long and the puzzles are on the easy side, so if you have 5 minutes play the game now! Sweet and absurd. It put a smile on my face throughout its short duration. Nice graphics and animations despite the low resolution.